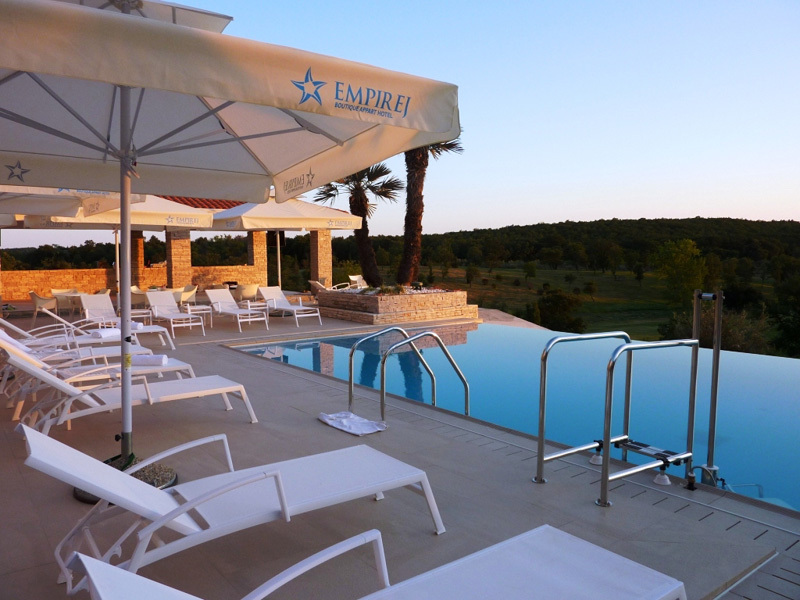 Boutique Apart Hotel Empirej is a newly built hotel just 3km outside the picturesque city of Porec, a wonderful tourist haven with a rich history. The hotel lies 500m from the beautiful Zelena Laguna Bay (“the Green Lagoon”) with countless beaches and coves, with the closest beach just 800m away. Zelena Laguna has been awarded the Blue Flag for many years now. The Blue Flag is an exclusive eco-label award given to beaches that meet strict criteria for both water quality and environmental management. Several hotels, camps and a little marina are situated around Porec’s Zelena Laguna Bay, making it a popular location for swimming, water sports and sunbathing. There are plenty of restaurants, shops, pools and sport facilities to be found, such as mini golf courses, basketball fields and soccer fields, tennis courts, diving schools and a horse riding school. Despite the presence of hotels and camps, there are still a lot of natural, quiet beaches to be found surrounded with pine trees which provide shade. There is also special reserved beach for naturists. During the summer months there is a special tourist train that runs from Zelena Laguna to the centre of Porec. Boutique Apart Hotel Empirej offers 22 luxurious apartments, each with its own balcony. The apartments are equipped with high quality luxury furniture, a bathroom with a bath in the smaller apartments and two bathrooms (with a bath and shower) in the larger apartments, a fully equipped kitchen with a microwave oven and dishwasher, air conditioning and satellite television. 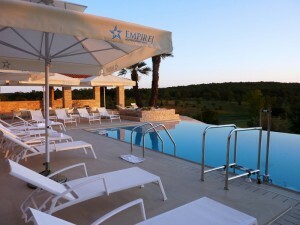 Hotel Empirej offers breakfast and half board in its spacious dining area and there is also a bar for its guests. Amongst the hotel’s facilities are 24 hour reception, an outdoor swimming pool and private garden, free parking, family rooms, smoking and non-smoking areas, safes, luggage storage, free wireless internet, air-conditioned public areas, daily papers and laundry services. The hotel also offers car and bicycle rental. Transfers, baby sitting services and excursion programs are available upon request.